The postoperative appearance of a beautifully designed closure or flap can be compromised if an incorrect suture technique is chosen or if the execution is poor. Conversely, meticulous suturing technique cannot fully compensate for improper surgical technique. Poor incision placement with respect to relaxed skin tension lines, excessive removal of tissue, or inadequate undermining may limit the surgeon’s options in wound closure and suture placement. Gentle handling of the tissue is also important to optimize wound healing. Proper placement of sutures enhances the precise approximation of the wound edges, which helps minimize and redistribute skin tension. Wound eversion is essential to maximize the likelihood of good epidermal approximation. Eversion is desirable to minimize the risk of scar depression secondary to tissue contraction during healing. Usually, inversion is not desirable, and it probably does not decrease the risk of hypertrophic scarring in an individual with a propensity for hypertrophic scars. The elimination of dead space, the restoration of natural anatomic contours, and the minimization of suture marks are also important to optimize the cosmetic and functional results. Compared with running (continuous) sutures, interrupted sutures are easy to place, have greater tensile strength, and have less potential for causing wound edema and impaired cutaneous circulation. Interrupted sutures also allow the surgeon to make adjustments as needed to properly align wound edges as the wound is sutured. Disadvantages of interrupted sutures include the length of time required for their placement and the greater risk of crosshatched marks (ie, train tracks) across the suture line. The risk of crosshatching can be minimized by removing sutures early to prevent the development of suture tracks. Advantages of the simple running suture over simple interrupted sutures include quicker placement and more rapid reapproximation of wound edges. Disadvantages include possible crosshatching, the risk of dehiscence if the suture material ruptures, difficulty in making fine adjustments along the suture line, and puckering of the suture line when the stitches are placed in thin skin. Locked sutures have increased tensile strength; therefore, they are useful in wounds under moderate tension or in those requiring additional hemostasis because of oozing from the skin edges. Running locked sutures have an increased risk of impairing the microcirculation surrounding the wound, and they can cause tissue strangulation if placed too tightly. Therefore, this type of suture should be used only in areas with good vascularization. In particular, the running locked suture may be useful on the scalp or in the postauricular sulcus, especially when additional hemostasis is needed. A vertical mattress suture is especially useful in maximizing wound eversion, reducing dead space, and minimizing tension across the wound. One of the disadvantages of this suture is crosshatching. The risk of crosshatching is greater because of increased tension across the wound and the four entry and exit points of the stitch in the skin. The recommended time for removal of this suture is 5-7 days (before formation of epithelial suture tracks is complete) to reduce the risk of scarring. If the suture must be left in place longer, bolsters may be placed between the suture and the skin to minimize contact. The use of bolsters minimizes strangulation of the tissues when the wound swells in response to postoperative edema. Placing each stitch precisely and taking symmetric bites is especially important with this suture. The half-buried vertical mattress suture is used in cosmetically important areas such as the face. The pulley suture facilitates greater stretching of the wound edges and is used when additional wound closure strength is desired. The far-near near-far modification of the vertical mattress suture, which basically functions as a pulley suture, is useful when tissue expansion is desired, and it may be used intraoperatively for this purpose. This suture is also useful when one is beginning the closure of a wound that is under significant tension. Placing pulley stitches first allows the wound edges to be approximated, thereby facilitating the placement of buried sutures. When wound closure is complete, the pulley stitches may be either left in place or removed if wound tension has been adequately distributed after placement of the buried and surface sutures. The horizontal mattress suture is useful for wounds under high tension because it provides strength and wound eversion. This suture may also be used as a stay stitch for temporary approximation of wound edges, allowing placement of simple interrupted or subcuticular stitches. The temporary stitches are removed after the tension is evenly distributed across the wound. Horizontal mattress sutures may be left in place for a few days if wound tension persists after placement of the remaining stitches. In areas of extremely high tension at risk for dehiscence, horizontal mattress sutures may be left in place even after removal of the superficial skin sutures. However, they have a high risk of producing suture marks if left in place for longer than 7 days. Horizontal mattress sutures may be placed before a proposed excision as a skin expansion technique to reduce tension. Improved eversion may be achieved with this stitch in wounds without significant tension by using small bites and a fine suture. In addition to the risk of suture marks, horizontal sutures have a high risk of tissue strangulation and wound edge necrosis if tied too tightly. Taking generous bites, using bolsters, and cinching the suture only as tightly as necessary to approximate the wound edges may decrease the risk, as does removing the sutures as early as possible. Placing sutures at a greater distance from the wound edge facilitates their removal. A buried dermal-subdermal suture maximizes wound eversion. It is placed so that the suture is more superficial away from the wound edge. The running subcuticular suture is valuable in areas where tension is minimal, dead space has been eliminated, and the best possible cosmetic result is desired. Because the epidermis is penetrated only at the beginning and end of the suture line, the subcuticular suture effectively eliminates the risk of crosshatching. The suture does not provide significant wound strength, though it does precisely approximate the wound edges. Therefore, the running subcuticular suture is best reserved for wounds in which the tension has been eliminated with deep sutures, and the wound edges are of approximately equal thicknesses. The corset plication technique is used in wounds wider than 4 cm that are under excess tension. It creates natural eversion and better wound edge approximation. This technique eases subsequent placement of intradermal sutures, in that wound diameter and tension are significantly reduced. Effective suturing technique depends on appropriate selection of sutures, surgical gloves, needles, and needle holders (see Equipment). Much of the process surrounding suture selection depends on surgeon training and preference. A wide variety of suture materials are available for each surgical location and surgical requirement. Generally, the surgeon selects the smallest suture that adequately holds the healing wound edges. The tensile strength of the suture should never exceed the tensile strength of the tissue. As the wound heals, the relative loss of suture strength over time should be slower than the gain of tissue tensile strength. Certain general principles can be applied to suture selection. Sutures are no longer needed when a wound has reached maximum strength. Therefore, nonabsorbable suture should be considered in skin, fascia, and tendons (slowly healing tissues), whereas mucosal wounds (rapidly healing tissues) may be closed with absorbable sutures. Aesthetic concerns are at a premium in regions of the head and neck such as the eyelid, periorbital area, nose, pinna, lip, and vermillion. In these areas, tensile strength requirements tend to be less, and smaller suture sizes are preferred. However, the mobility of the lip and vermillion requires a relatively higher suture tensile strength. The activity and mobility of the face, anterior and posterior neck, scalp, superior trunk, and nasal and oral mucosa demand higher tensile strength requirements in suture selection. Additionally, major musculocutaneous flaps tend to be closed under significant tension, requiring maximal long-term tensile strength. Because the presence of foreign bodies in contaminated tissues may facilitate infection, special consideration of suture selection in these locations (eg, a contaminated posttraumatic wound) is imperative. Multifilament sutures are more likely to harbor contaminants than monofilament sutures are; accordingly, monofilament sutures are generally preferable in potentially contaminated tissues. The smallest inert monofilament suture materials (eg, nylon or polypropylene) should be sued in this setting. The optimal suture size is generally the smallest size that can still effectively achieve the desired tension-free closure. If wound tension is high, smaller-diameter sutures may actually injure tissues by cutting through them. Therefore, the tensile strength of the suture and that of the tissue should be closely matched. 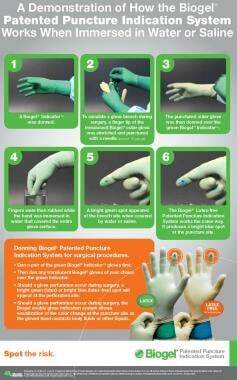 Poster for Biogel Puncture Indication System. No standardized sizing system or nomenclature is available for needles. The main consideration in needle selection is to minimize trauma. A taper-point needle is sufficient for tissues that are easy to penetrate. Cutting needles are typically reserved for tough tissues. As a general rule, taper-point needles may be used for all closures except skin sutures. The length, diameter, and curvature of the needle influence the surgeon’s ability to place a suture. Ideally, the needle-body diameter matches the suture size. No standardized sizing system or nomenclature is available for needle holders. Needle control and performance is affected by the stability of the needle within the needle holder; thus, for a secure needle hold and prevention of rocking, turning, and twisting, the jaws of the needle holder must be appropriate to the needle size. Often, the surface contact with the needle-holder jaws and the bending moment of the needle are maximized with an ovoid cross-section of the needle body. In addition, the handle of the needle holder must be appropriate for the depth needed for the suture placement. A mechanical advantage for exerting force through the needle point is created by the difference between the length of the handle and the jaw. The needle-holder clamping moment is a measure of the force applied to a suture needle by the needle holder, and the needle-yield moment is the amount of deformation that can occur before a needle is permanently deformed. Thus, when the needle-holder clamping moment is greater than the needle-yield moment, the needle is likely to be permanently deformed, which may lead to complications. A study by Lin et al found the handling characteristics of Polysorb sutures to be superior to those of polyglactin 910 (Vicryl) sutures. With comparable knot construction and suture sizes, the knot-breaking strength of Polysorb sutures was significantly greater than that of polyglactin 910 sutures. In addition, the mean maximum knot rundown force noted with Polysorb sutures was significantly lower than that noted with polyglactin 910 sutures, facilitating knot construction. Drake et al used a miniature swine model to study the determinants of suture extrusion after subcuticular closure by synthetic braided absorbable sutures in dermal skin wounds. Standard, full-thickness skin incisions were made on each leg and abdomen. The wounds were closed with either Polysorb or polyglactin 910 sutures. Each of the skin incisions was closed with five interrupted subcuticular vertical, loops secured with a surgeon’s knot. The loops were secured with three-throw knots in one pig, four-throw knots in the second pig, and five-throw knots in the third pig. Suture extrusion, wound dehiscence, stitch abscess, and granuloma formation were all observed. The cumulative incidence of suture extrusion over 5 weeks ranged from 10% to 33%. Polyglactin 910 sutures had a higher cumulative incidence of suture extrusion than Polysorb sutures did (31% vs 19%). With Polysorb sutures, the five-throw surgeon’s knot had a higher cumulative incidence of suture extrusion than the three-throw or four-throw surgeon’s knot (30% vs 17% and 10%, respectively). In addition, the tensile strengths of Maxon and polyglactin 910 significantly exceeded those of PDS II and chromic catgut during the critical period of wound healing. Maxon and PDS II retained a larger percentage of tensile strength during the long postoperative period, whereas polyglactin 910 and chromic catgut were mostly absorbed. The investigators concluded that Maxon was an excellent addition to the armamentarium of the surgeon. A randomized control study of the barbed suture (V-Loc) confirmed the unique performance of this suture for gastrointestinal (GI) wound closure. The V-Loc wound closure device appeared to offer GI closure comparable to that achieved with 3-0 Maxon while being significantly faster. However, further studies with V-Loc are required to evaluate its use in laparoscopic surgery. When Pineros-Fernandez et al compared the biomechanical performance of polyglytone 621 (Caprosyn) suture with that of chromic gut suture, both suture types provided comparable resistance to wound disruption. The biomechanical performance studies included quantitative measurements of wound security, strength loss, mass loss, potentiation of infection, tissue drag, knot security, and knot rundown, as well as suture stiffness. Before implantation, suture loops of Caprosyn had significantly greater mean breaking strength than suture loops of chromic gut did  ; 3 weeks after implantation of these absorbable suture loops, the sutures had no appreciable strength. The rate loss of suture mass of these two sutures was similar. As expected, chromic gut sutures potentiated significantly more infection than Caprosyn sutures did. However, the handling properties of Caprosyn sutures were far superior to those of chromic gut sutures, and the smooth surface of the Caprosyn sutures encountered lower drag forces than the chromic gut sutures did. Furthermore, it was much easier to reposition the Caprosyn knotted sutures than the knotted chromic gut sutures. In the case of chromic gut sutures, it was not possible to reposition a two-throw granny knot. These biomechanical performance studies demonstrated the superior performance of the synthetic Caprosyn sutures compared with chromic gut sutures and provided compelling evidence of why Caprosyn sutures are an excellent alternative to chromic gut sutures. Adams B, Anwar J, Wrone DA, Alam M. Techniques for cutaneous sutured closures: variants and indications. Semin Cutan Med Surg. 2003 Dec. 22(4):306-16. [Medline]. Ratner D, Nelson BR, Johnson TM. Basic suture materials and suturing techniques. Semin Dermatol. 1994 Mar. 13(1):20-6. [Medline]. Kromka W, Cameron M, Fathi R. Tie-Over Bolster Dressings vs Basting Sutures for the Closure of Full-Thickness Skin Grafts: A Review of the Literature. J Cutan Med Surg. 2018 Jun 1. 1203475418782152. [Medline]. Kandel EF, Bennett RG. The effect of stitch type on flap tip blood flow. J Am Acad Dermatol. 2001 Feb. 44(2):265-72. [Medline]. Chan JL, Miller EK, Jou RM, Posten W. Novel surgical technique: placement of a deep tip stitch. Dermatol Surg. 2009 Dec. 35(12):2001-3. [Medline]. Bechara FG, Al-Muhammadi R, Sand M, Tomi NS, Altmeyer P, Hoffmann K. A modified corner stitch for fixation of flap tips. Dermatol Surg. 2007 Oct. 33(10):1277-9. [Medline]. Yag-Howard C. Novel surgical approach to subcutaneous closure: the subcutaneous inverted cross mattress stitch (SICM Stitch). Dermatol Surg. 2011 Oct. 37(10):1503-5. [Medline]. Wade RG, Wormald JC, Figus A. Absorbable versus non-absorbable sutures for skin closure after carpal tunnel decompression surgery. Cochrane Database Syst Rev. 2018 Feb 1. 2:CD011757. [Medline]. Alam M, Goldberg LH. Utility of fully buried horizontal mattress sutures. J Am Acad Dermatol. 2004 Jan. 50(1):73-6. [Medline]. Moody BR, McCarthy JE, Linder J, Hruza GJ. Enhanced cosmetic outcome with running horizontal mattress sutures. Dermatol Surg. 2005 Oct. 31(10):1313-6. [Medline]. Chacon AH, Shiman MI, Strozier N, Zaiac MN. Horizontal running mattress suture modified with intermittent simple loops. J Cutan Aesthet Surg. 2013 Jan. 6(1):54-6. [Medline]. [Full Text]. Eleftheriou LI, Weinberger CH, Endrizzi BT, et al. The Victory stitch: a novel running v-shaped horizontal mattress suturing technique. Dermatol Surg. 2011 Nov. 37(11):1663-5. [Medline]. Alam M, Posten W, Martini MC, Wrone DA, Rademaker AW. Aesthetic and functional efficacy of subcuticular running epidermal closures of the trunk and extremity: a rater-blinded randomized control trial. Arch Dermatol. 2006 Oct. 142(10):1272-8. [Medline]. Maher IA, Bingham J, Mellette R. A running modification of the percutaneous buried vertical mattress. Dermatol Surg. 2012 Sep. 38(9):1560-2. [Medline]. Yag-Howard C. Zipper stitch: a novel aesthetic subcutaneous closure. Dermatol Surg. 2013 Sep. 39(9):1400-2. [Medline]. Tierney E, Kouba DJ. A subcutaneous corset plication rapidly and effectively relieves tension on large linear closures. Dermatol Surg. 2009 Nov. 35(11):1806-8. [Medline]. Meng F, Andrea S, Cheng S, Wang Q, Huo R. Modified Subcutaneous Buried Horizontal Mattress Suture Compared With Vertical Buried Mattress Suture. Ann Plast Surg. 2017 Mar 7. [Medline]. Edlich RF, Long WB 3rd, Gubler KD, Rodeheaver GT, Thacker JG, Borel L, et al. Citizen's Petition to Food and Drug Administration to ban cornstarch powder on medical gloves: Maltese cross birefringence. Am J Emerg Med. 2009 Feb. 27(2):227-35. [Medline]. Lin KY, Farinholt HM, Reddy VR, Edlich RF, Rodeheaver GT. The scientific basis for selecting surgical sutures. J Long Term Eff Med Implants. 2001. 11(1-2):29-40. [Medline]. Drake DB, Rodeheaver PF, Edlich RF, Rodeheaver GT. Experimental studies in swine for measurement of suture extrusion. J Long Term Eff Med Implants. 2004. 14(3):251-9. [Medline]. Sanz LE, Patterson JA, Kamath R, Willett G, Ahmed SW, Butterfield AB. Comparison of Maxon suture with Vicryl, chromic catgut, and PDS sutures in fascial closure in rats. Obstet Gynecol. 1988 Mar. 71(3 Pt 1):418-22. [Medline]. Demyttenaere SV, Nau P, Henn M, Beck C, Zaruby J, Primavera M, et al. Barbed suture for gastrointestinal closure: a randomized control trial. Surg Innov. 2009 Sep. 16(3):237-42. [Medline]. Pineros-Fernandez A, Drake DB, Rodeheaver PA, Moody DL, Edlich RF, Rodeheaver GT. CAPROSYN*, another major advance in synthetic monofilament absorbable suture. J Long Term Eff Med Implants. 2004. 14(5):359-68. [Medline]. Szarmach RR, Livingston J, Edlich RE. An expanded surgical suture and needle evaluation and selection program by a healthcare resource management group purchasing organization. J Long Term Eff Med Implants. 2003. 13(3):155-70. [Medline]. Tera H, Aberg C. Tissue holding power to a single suture in different parts of the alimentary tract. Acta Chir Scand. 1976. 142(5):343-8. [Medline]. Van Winkle W Jr, Hastings JC. Considerations in the choice of suture material for various tissues. Surg Gynecol Obstet. 1972 Jul. 135(1):113-26. [Medline]. Salthouse TN, Williams JA, Willigan DA. Relationship of cellular enzyme activity to catgut and collagen suture absorption. Surg Gynecol Obstet. 1981. 129:691-6. Regan T, Lawrence N. Comparison of poliglecaprone-25 and polyglactin-910 in cutaneous surgery. Dermatol Surg. 2013 Sep. 39(9):1340-4. [Medline]. Faulkner BC, Gear AJ, Hellewell TB, Mazzarese PM, Watkins FH, Edlich RF. Biomechanical performance of a braided absorbable suture. J Long Term Eff Med Implants. 1996. 6(3-4):169-79. [Medline]. Murtha AP, Kaplan AL, Paglia MJ, Mills BB, Feldstein ML, Ruff GL. Evaluation of a novel technique for wound closure using a barbed suture. Plast Reconstr Surg. 2006 May. 117(6):1769-80. [Medline]. Edlich RF, Drake DB, Rodeheaver GT, Winters KL, Greene JA, Gubler KD, et al. Syneture stainless STEEL suture. A collective review of its performance in surgical wound closure. J Long Term Eff Med Implants. 2006. 16(1):101-10. [Medline]. Rodeheaver GT, Nesbit WS, Edlich RF. Novafil. A dynamic suture for wound closure. Ann Surg. 1986 Aug. 204(2):193-9. [Medline]. [Full Text]. Rodeheaver GT, Shimer AL, Boyd LM, Drake DB, Edlich RF. An innovative absorbable coating for the polybutester suture. J Long Term Eff Med Implants. 2001. 11(1-2):41-54. [Medline]. Rosenzweig LB, Abdelmalek M, Ho J, Hruza GJ. Equal cosmetic outcomes with 5-0 poliglecaprone-25 versus 6-0 polypropylene for superficial closures. Dermatol Surg. 2010 Jul. 36(7):1126-9. [Medline]. Kaulbach HC, Towler MA, McClelland WA, Povinelli KM, Becker DG, Cantrell RW, et al. A beveled, conventional cutting edge surgical needle: a new innovation in wound closure. J Emerg Med. 1990 May-Jun. 8(3):253-63. [Medline]. Abidin MR, Towler MA, Thacker JG, Nochimson GD, McGregor W, Edlich RF. New atraumatic rounded-edge surgical needle holder jaws. Am J Surg. 1989 Feb. 157(2):241-2. [Medline]. Richey ML, Roe SC. Assessment of knot security in continuous intradermal wound closures. J Surg Res. 2005 Feb. 123(2):284-8. [Medline]. Adams B, Levy R, Rademaker AE, Goldberg LH, Alam M. Frequency of use of suturing and repair techniques preferred by dermatologic surgeons. Dermatol Surg. 2006 May. 32(5):682-9. [Medline]. Wong NL. Review of continuous sutures in dermatologic surgery. J Dermatol Surg Oncol. 1993 Oct. 19(10):923-31. [Medline]. Nahas FX, Solia D, Ferreira LM, Novo NF. The use of tissue adhesive for skin closure in body contouring surgery. Aesthetic Plast Surg. 2004 May-Jun. 28(3):165-9. [Medline]. Nitsch A, Pabyk A, Honig JF, Verheggen R, Merten HA. Cellular, histomorphologic, and clinical characteristics of a new octyl-2-cyanoacrylate skin adhesive. Aesthetic Plast Surg. 2005 Jan-Feb. 29(1):53-8. [Medline]. Singer AJ, Quinn JV, Hollander JE. The cyanoacrylate topical skin adhesives. Am J Emerg Med. 2008 May. 26(4):490-6. [Medline]. Quinn JV, Osmond MH, Yurack JA, Moir PJ. N-2-butylcyanoacrylate: risk of bacterial contamination with an appraisal of its antimicrobial effects. J Emerg Med. 1995 Jul-Aug. 13(4):581-5. [Medline]. Hasan Z, Gangopadhyay AN, Gupta DK, Srivastava P, Sharma SP. Sutureless skin closure with isoamyl 2-cyanoacrylate in pediatric day-care surgery. Pediatr Surg Int. 2009 Dec. 25(12):1123-5. [Medline]. Krishnamoorthy B, Najam O, Khan UA, Waterworth P, Fildes JE, Yonan N. Randomized prospective study comparing conventional subcuticular skin closure with Dermabond skin glue after saphenous vein harvesting. Ann Thorac Surg. 2009 Nov. 88(5):1445-9. [Medline]. Perin LF, Helene A Jr, Fraga MF. Sutureless closure of the upper eyelids in blepharoplasty: use of octyl-2-cyanoacrylate. Aesthet Surg J. 2009 Mar-Apr. 29(2):87-92. [Medline]. Bain MA, Peterson EA, Murphy RX Jr. Dermabond bolster-assisted primary closure of atrophic skin. Plast Reconstr Surg. 2009 Apr. 123(4):147e-149e. [Medline]. Sniezek PJ, Walling HW, DeBloom JR 3rd, Messingham MJ, VanBeek MJ, Kreiter CD. A randomized controlled trial of high-viscosity 2-octyl cyanoacrylate tissue adhesive versus sutures in repairing facial wounds following Mohs micrographic surgery. Dermatol Surg. 2007 Aug. 33(8):966-71. [Medline]. Greenhill GA, O'Regan B. Incidence of hypertrophic and keloid scars after N-butyl 2-cyanoacrylate tissue adhesive had been used to close parotidectomy wounds: a prospective study of 100 consecutive patients. Br J Oral Maxillofac Surg. 2009 Jun. 47(4):290-3. [Medline]. Tsui YK, Gogolewski S. Microporous biodegradable polyurethane membranes for tissue engineering. J Mater Sci Mater Med. 2009 Aug. 20(8):1729-41. [Medline]. Kaminer MS, Bogart M, Choi C, Wee SA. Long-term efficacy of anchored barbed sutures in the face and neck. Dermatol Surg. 2008 Aug. 34(8):1041-7. [Medline]. Lee CJ, Park JH, You SH, Hwang JH, Choi SH, Kim CH. Dysesthesia and fasciculation: unusual complications following face-lift with cog threads. Dermatol Surg. 2007 Feb. 33(2):253-5; discussion 255. [Medline]. Silva-Siwady JG, Díaz-Garza C, Ocampo-Candiani J. A case of Aptos thread migration and partial expulsion. Dermatol Surg. 2005 Mar. 31(3):356-8. [Medline]. Villa MT, White LE, Alam M, Yoo SS, Walton RL. Barbed sutures: a review of the literature. Plast Reconstr Surg. 2008 Mar. 121(3):102e-108e. [Medline]. Skvarka CB, Greenbaum SS. A novel surgical technique: placement of the suture lateral to the punch biopsy defect. Dermatol Surg. 2007 Feb. 33(2):222-4. [Medline]. Needle is placed vertically and longitudinally perpendicular to needle holder. Needle holder is held through loops between thumb and fourth finger, and index finger rests on fulcrum of instrument. Needle holder is held in palm, allowing greater dexterity. Simple interrupted suture placement. Bottom right image shows a flask-shaped stitch, which maximizes eversion. Subcuticular stitch. Skin surface remains intact along length of suture line. Commonly used suture needles, with cross-sections of needles shown at point, body, and swage. (A) Taper-point needle. (B) Conventional cutting needle. (C) Reverse cutting needle. Interaction between needle holder and suture needle. (A) Needle holder of appropriate size for needle. (B) Needle holder that is too large for needle—pressure applied by needle holder leads to inadvertent straightening of suture needle. (C) Needle holder that is too small for needle—needle rotates around long axis of needle holder.